Sold by Sumpple AU and Fulfilled by Amazon. Gift-wrap available. 1. 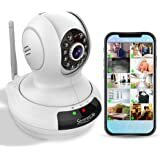 Wireless Wifi Remote Live Video Streaming via iPhone, iPad, Android SmartPhones and Tablet PCs, Wider Angle Pan/Tilt (Maximum area coverage with 340 degree pan and 120 degree tilt) and Digital Zoom through APP Remote Control. 2. 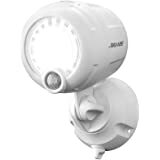 Two-Way Audio Function, and Motion, Sound, Temperature and Humidity Detection. Support Music Uploading from Cell Phone and Music Player in the App. 3. 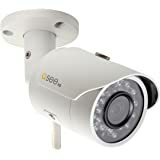 Night Vision up to 15 meters in Darkness with Motion Detection Alert via APP or Email, 1280*720 HD Image Quality, Support Image Capturing and Video Recording, support up to 64GB micro SD card recording. 4. Support Wireless Wifi or wired network cable connection. Instant Plug and Play of wireless or wired installation with QR code scan of APP setup and quick Log-in. Simple and smart connection mode: With WPS (Wi-Fi Protected Setup ) function which can achieve "a key networking". 5. 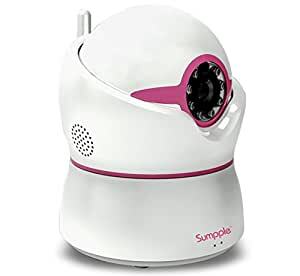 Monitor on the compatible smartphone or Tablet PC: Sumpple wifi video monitor camera allows people to watch over their home, office, baby, pets while being anywhere with an unlimited range and unlimited time by compatible IOS or Android 3G/4G smartphone, tablet PC or Laptop PC. This camera is a class above other baby monitors and video wifi monitoring cameras. Comes with easy step by step instructions. (12 month guarantee). Whether you are using it for monitoring your kids or your office, the S822 is a fresh revolutionary design, making it easy and fun to use. 9. Support RJ45, Support 9 Channels in the same time. The app barely works. Always freezes up. At one point it over heated my phone and burned its image into my phones screen. I recently switched routers and have not been able to connect to the actual camera. It won't let me reset the wifi associated with it. It won't let me reconnect the camera, and it now won't even let me log in. The camera often sticks and I manual have move it. My baby wakes up from the noise the camera makes when it moves. There is a bright light that we have tried to cover with tape that catches my daughters attention. I bought this after our Motorola camera died after 3 years. This camera has an incredible picture quality. Great connection and easy to set up and use. No matter what my husband and I tried, we could not connect this to our wireless Internet. We contacted customer service and they are located in Asia and therefore not available during the hours we were trying to trouble shoot. Their suppport number is long distance as they don't have a toll free number. They also don't work weekends...so we tried to email but got very basic information so we ended up returning the product as we felt they would not be accessible should more problems occur. 5.0 out of 5 starsAmazing! this is an amazing camera with great customer service. Video stopped working 4 months after purchase. Only sound available. Have had to redo account previously to get it to work. Now is not working again! Customer service wanted my password to try to fix problem. I was not comfortable doing this. So... I will be purchasing another brand. Supple, fix your software.